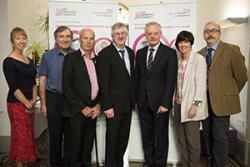 With the Minister (centre) were Dr Gill Windle, Prof Bob Woods, Chris Roberts, who has dementia, Vice Chancellor Prof John G Hughes, Prof Jo Rycroft-Malone and Prof Chris Burton.Ground-breaking research which is set to improve healthcare in Wales and the UK will be showcased at Bangor University today (Thursday 2 July). Three projects in particular are to be given prominence, during a visit by Welsh Government Health Minister Mark Drakeford to the University’s College of Health & Behavioural Sciences, due to their potential to impact on services and patients. A programme developed by experts at Bangor University to assist rehabilitation post-stroke is showing considerable promise and is already being used with other patient groups, even before the research is complete. Many programmes to support life after stroke have proved ineffective. These are usually led by health professionals- and that may be at the root of the problem. Bangor University’s innovative approach is proving a breakthrough, however. The new approach: training stroke survivors as peer coaches, is proving so successful that it is already being applied elsewhere, such as with people who have experienced traumatic brain injury. The research, still on-going, is assessing the effectiveness of marrying expertise at the School of Healthcare Sciences, with the insight and experience of stroke survivors, to develop the peer coaching programme. Research at Bangor University’s School of Healthcare Sciences is also set to improve patient care for the terminally ill.
One challenge, and in particular, in relation to stroke patients, is to recognise when a patient’s condition is terminal and to initiate an appropriate conversation with the patient to ensure appropriate end of life care for that individual. This particular research will assist the healthcare and medical professionals to asses at exactly what point that conversation should take place. The researchers, experts in translating research into effective practice in a healthcare environment, have been working with research and clinical partners across the UK to help professionals improve this important aspect of acute stroke services. In addition to research, the School works closely with the Betsi Cadwaladr University Health Board (BCUHB) to improve the experience of families and patients in the region. For example, experts at the School are working with nursing leaders within BCUHB to improve the quality of care within the Welsh Community Hospital Sector. This research group has already identified priorities for a quality improvement strategy for this important part of the healthcare system. “Offering excellence in both research and teaching, the School of Healthcare Sciences has a strong track record in working in partnership with health services across the United Kingdom. We are delighted to be supporting Betsi Cadwaladr University Health Board in this work with community hospitals in North Wales, and in other areas, to continually enhance patient experiences and outcomes”. Minister Mark Drakeford will also launch Join Dementia Research, a joint initiative that will accelerate the pace of dementia research in Wales by allowing people with and without dementia to register their interest in studies, and helping researchers find the right participants at the right time.